Eight basic items you will need to collect for your hot wax kit. You can always add more later. You can find them on line or in a local ski shop. Small rags or a towel you can get wet to clean the dust and dirt off your bases. Two small boxes, wood blocks, or bench top saw horses to place your skis or snowboard on while you work. Some people like to use a ski or snowboard vice which can be very expensive and may no be needed. A drop cloth to catch wax drops and shavings and make for an easy clean up. a strong rubber band to put on the ski breaks moving them up and out of the way. Or you can use a heavy duty twist tie. A selection of temperature specific wax bars to use individually or blend together to adjust your wax to current conditions. You can find them (here). An iron made specially for hot waxing do not use a house hold clothes iron. The wax will ruin your clothes iron. A 1/4 thick plastic scraper to scrape off the excess wax. A stiff nylon brush or set of brushes hard, medium, & soft to buff out the base to smooth and ready to ride finish. Learn the basic steps to hot wax (here). 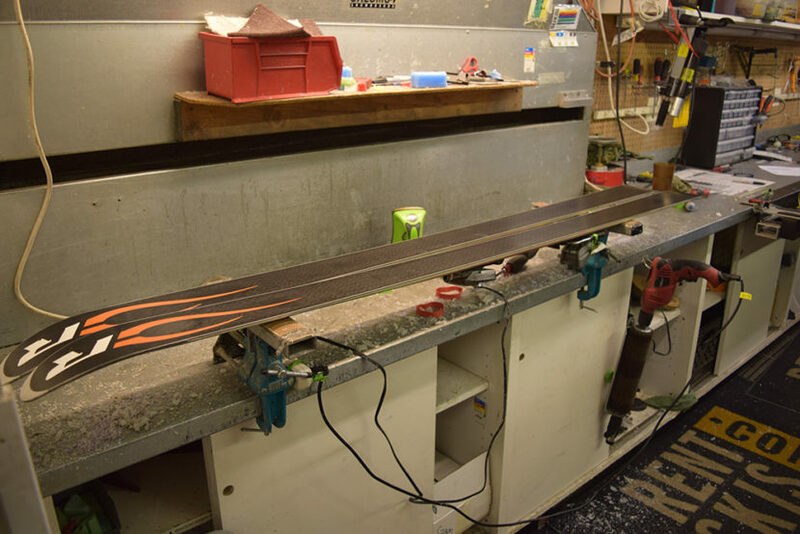 Why wax my skis or snowboard?